This tahini and molasses dessert is from Turkey which they call ‘Tahin Pekmez’. It is so easy and fast to make as it requires no cooking or no baking. All you do is mix it up and that only takes a few minutes and voila it is done! It can be eaten with a spoon, but it is a very very sweet dessert. Traditionally it is eaten with fresh crunchy bread dipped in or mixed in it. The good thing about this dessert is that in an airtight container at room temperature, it stays good for a very long time! Best not to put it in the fridge as it gets hard and not usable just leave it on the counter. When you are about to eat it, just give it a stir, and put it on your porridge, rice cake or bread. Enjoy! 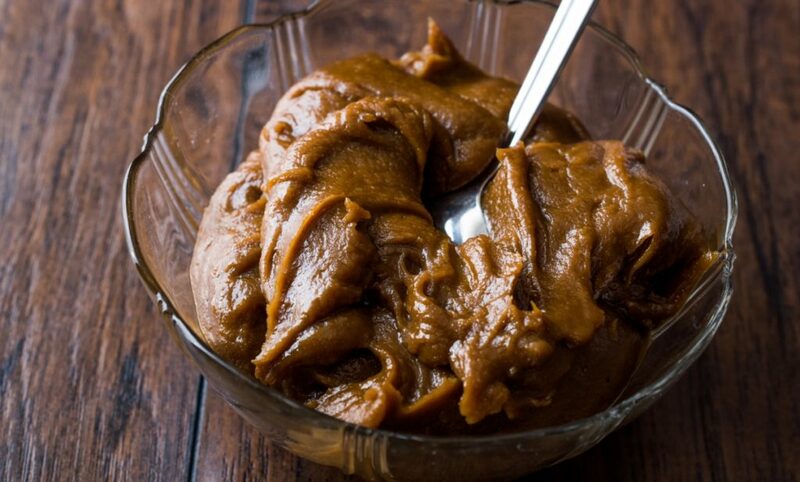 Put tahini in a bowl, and then mix in the molasses with a spoon. Enjoy on a slice of bread or a rice cake. YUM! The measurements can be changed for your taste. If you want it sweeter, add more molasses or if you want it less sweet add more tahini. Enjoy your tahini and molasses dessert. Gingerbread Cake – Gluten free – This cake is delicious! The heat of the ginger balances off the sweeter elements so it doesn’t feel heavy. 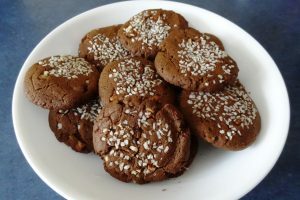 Molasses and Tahini Cookies – These cookies are Middle Eastern inspired, delicious, and easy to make! Coming soon: Traditional Native Pudding – This pudding is an old favourite of mine which I used to make often.